To SJP Properties for incorporating smart growth design into the first new buildings to include a major corporate headquarters on the Hoboken waterfront. When a major international company decides to move its headquarters from one site to another, the decision is not made lightly. The pros and cons are weighed, employees are consulted, cost/benefit analyses are done and the entire undertaking is planned carefully. It is for this reason that companies don’t tend to move with any frequency. The cost and logistics of such a move are usually enough to make a company cleave to its old location and manage a growing staff by reducing personal workspace or leasing nearby offices. But global publisher John Wiley & Sons, headquartered in Manhattan since 1807, decided to make this challenging move when its executives were presented with the amenities in and around Hoboken’s Waterfront Corporate Center. 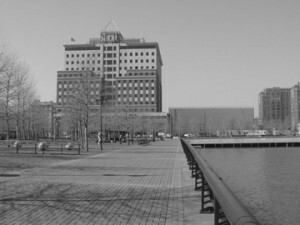 Waterfront Corporate Center is the cornerstone of the Hoboken Waterfront Redevelopment Plan and one of the most visible signs of the work that has been done to revitalize an area whose abandoned buildings, fenced-off lots and brooding piers provided an all too obvious contrast to the lively, attractive, diversified downtown area of Hoboken. The Hoboken Waterfront project was conceived in the late 1980s and improved following input from local community groups in the early 1990s. The resulting plan called for a planned mixed-use development of at least 2.3 million square feet of space on three new city blocks, located next to the historic Hoboken Terminal. Most importantly, the new development was to enhance and enable community access to the waterfront. As part of the plan, the City of Hoboken joined forces with the Port Authority to transform 50 acres of unused waterfront into a unique commercial, residential and recreational area to preserve and complement the City’s architectural heritage. The Port Authority paved the way for this first phase in 1999 by upgrading the surrounding infrastructure, including road improvements, a waterfront walkway and the renovation of a 5-acre pier, which was converted to Pier A Park. The Port Authority allocated additional funds for another park on Pier C, which when completed, will provide additional public space for the community and tenants of office complexes. SJP Properties entered into a unique public/private partnership with the city and the Port Authority and took responsibility for the development of the office complexes at the Waterfront. It saw the possibilities of the redevelopment project and took the risk that the market place would come to view Hoboken as a viable location for companies to relocate to. 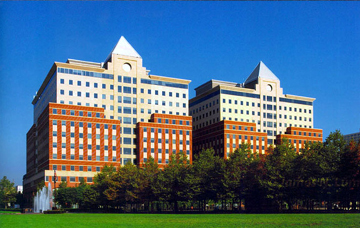 When the plans were first developed, Hoboken had little in the way of office space and the task of luring a major corporation to an unknown destination was laid at SJP’s door. By securing Wiley as a tenant in the first building of the Corporate Center, SJP Properties eased the path for others to follow. Today, the two Corporate Center buildings continue to attract corporate headquarters, offices and employees to Hoboken. Since the 2002 arrival of Wiley’s 950 employees, Marsh & McLennan, the world’s leading insurance consulting firm, has moved in as the anchor tenant in the second building while other floors have been leased by Mizuho Securities, Japan’s Sumitomo Trust and Banking and France’s CPR. Retail space on the ground floor offers banks, restaurants, fitness centers and other amenities to employees, visitors and city residents. While experience tells us that corporations see a high level of staff shrinkage following a relocation Wiley has noted that only 10 employees in recent years have cited the move to Hoboken as a reason for their departure. The Corporate Center’s proximity to Manhattan means that working at the center provides all the benefits of working in the city without the hassles of city commuting and getting around. Before any tenant was approached or blueprint was developed, SJP Properties saw the potential of the proposed site for the Corporate Center. For SJP Properties, the proximity to the Hoboken Terminal which offers an array of transit options unmatched anywhere else in the state, was a key factor in the decision to take the risk and create a viable location for high class office space. The Hoboken Terminal offers employees access to their offices by NJ Transit train and bus, PATH, the New York Waterway Ferry and the Hudson-Bergen Light Rail Transit system. Visitors can fly into Newark airport and take a train directly to Corporate Center. The setting for the Corporate Center is uniquely park-like because of the walkway and urban park that constitutes 60 percent of the site, providing employees, residents and visitors with a feeling of space in a dense urban setting, a connection with the waterfront and spectacular views of the Manhattan skyline. The two buildings that make up the Corporate Center were designed with the entire Waterfront Development area in mind: the buildings step back as they rise and are separated into two towers above the base to maximize the view corridor, so more park and open areas remain and the compact downtown feel is preserved. The buildings are constructed with brick, granite and cast stone facades that provide a balance between Hoboken’s historic character and contemporary architectural design. From its inception as a public/private partnership to the involvement of local residents and merchants, the Hoboken Waterfront Development is a great example of smart growth that not only enhances the economy but also the lives of the people who work and live there. The Corporate Center shows that state-of-the-art commercial development can create a compact downtown feel and also attract prestigious employers and highly skilled employees. SJP Properties has added approximately 1 million square feet of office and retail space to the economy of Hoboken and by doing so has added an extra dimension to an already fascinating city. The Hoboken Waterfront and the Waterfront Corporate Center stand out as positive additions to Hoboken’s economy, livability and vibrancy and define the best of smart growth in this state.